Hello, hello! 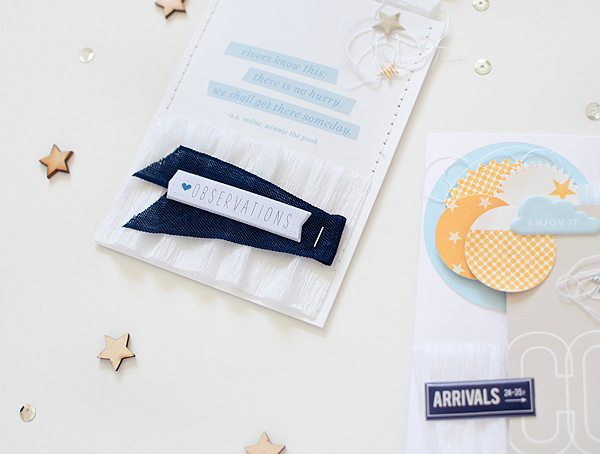 Welcome to the very first Gossamer Blue Inspiration Blog Hop with the awesome new team! The talents of these ladies make me want to create everyday so you're bound to find loads of inspiration during this tour. You should have arrived from Patricia's blog and I'm sure she had something wonderful there! I hope you like what you see here, too. We've had a surge in the births of baby boys in our family over the last year or so...3 to be exact, with one more on the way. 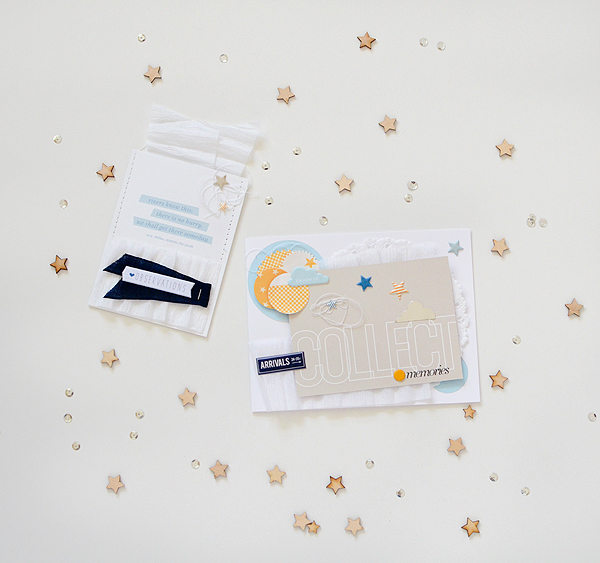 We recently had a family reunion of sorts when I travelled back to the East Coast for vacation, and I took along this card and gift for my cousin and his wife who are expecting their first baby in September. One thing I found exciting in making the set was that none of the elements I used were actually baby-related. 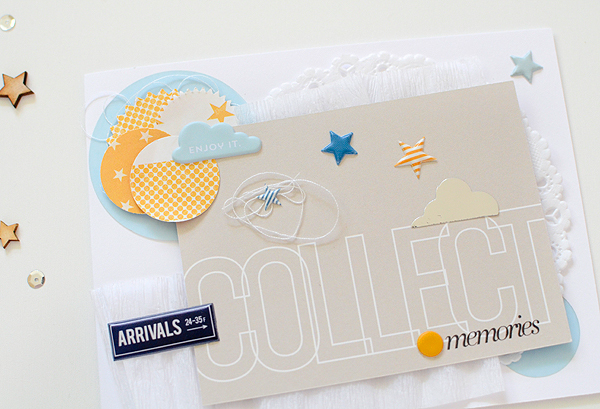 However, each phrase and image, when joined together, make for fitting new baby themes. Gotta love the versatility! The card from LP #3 with the Winnie the Pooh quote about not hurrying is perfect in color and sentiment. As parents, particularly of newborns, I think we're all inclined to wish that our children would hurry up and sleep through the night or not need to nurse so much or that the phase when babies cry for no obvious reason every night from 10-12 because they just can't get it together would please end soon! But childhood--especially infancy--is so fleeting and gone before you know it. There really is no need to rush. I wanted the expectant parents to keep that in mind so I adhered the Evalicious 'observations' puffy sticker to navy seam binding in the hope that they'll make a mental note. I lined the gift card holder (which is just 2 Life Pages cards sewn together to form a pocket) with crinkled white crepe paper so all they have to do is pull on it and the gift card will slide right out. 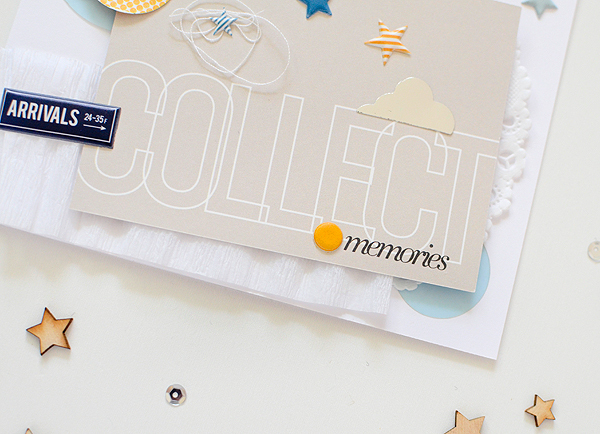 It's quite important to collect memories when you have a new little one, right? 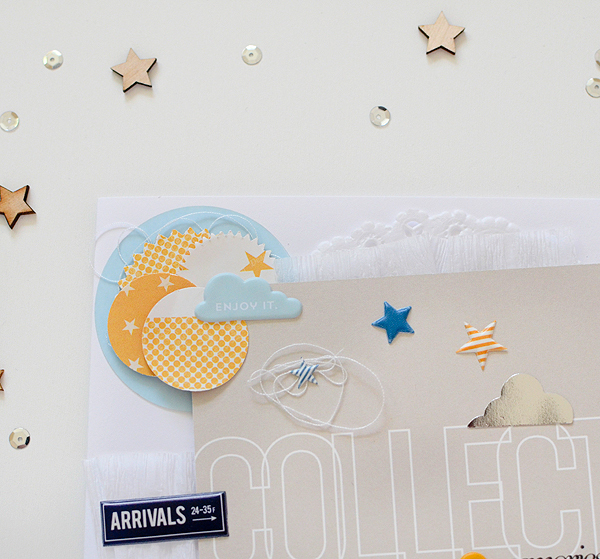 And I felt like a genius using the 'arrivals' sticker on a new baby card even though it's part of a travel collection, though I'm quite certain I'm not the first crafter who has ever made that connection! 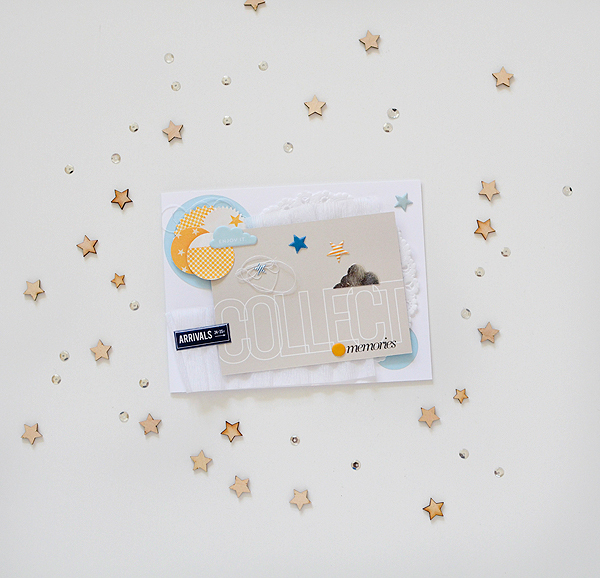 Stars, clouds, circles...I love all those shapes for baby boys, don't you? 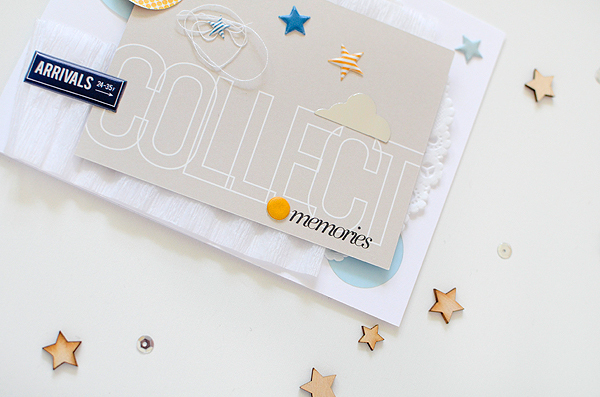 And those shades of orange and blue compliment each other so well; I especially love them against the greige LP card. I'm so glad you stopped by today! 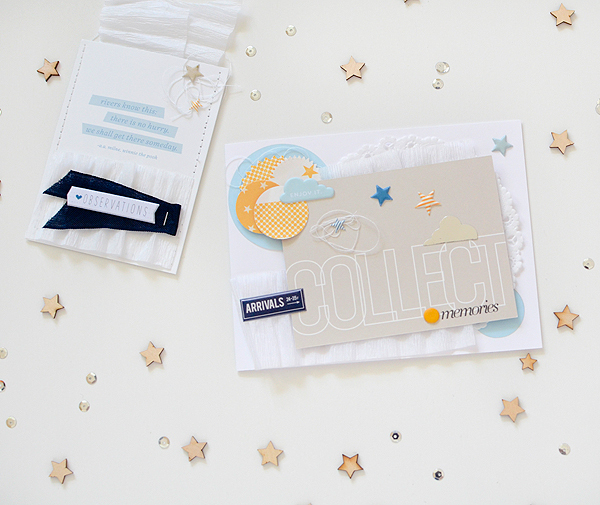 Have you been encouraged to put the July kits to good use? There are still a few kits left so check out the GB store quick, before they sell out! And up next on the blog hop is my friend Sandra Dietrich's page where I always find something inspiring. Rebecca, this is stunning!! So beautiful in every way. And I'm so impressed how you've managed to create such an awesome baby project without using anything baby related. Great job! I am smitten with that ruffle. So sweet! These are both so soft and pretty! I love the layering and the colors. Very nicely done. 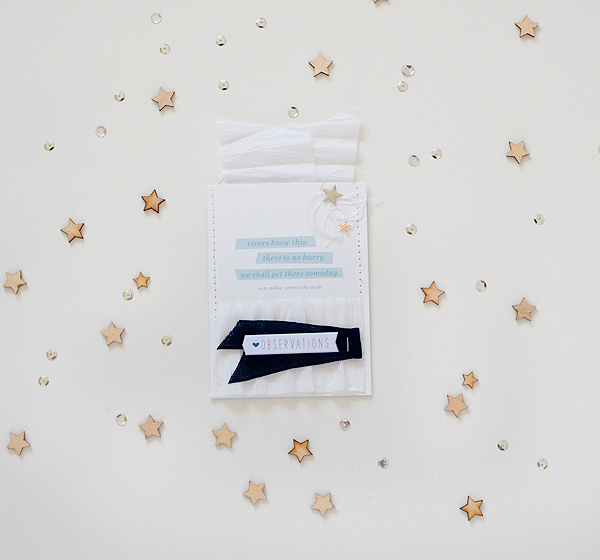 Such a beautiful and soft card-love it! Really cute cards! And I hadn't thought of using the kits for some baby related projects - but it fits so well! Really nice post, I am enjoying here a lot. Hi Rosiemary! The lake we always go back to is Keuka because that's where I grew up but I LOVE Skaneateles--it's such a sweet little village!